Christians are called to build community by welcoming others into our Church, but we are also called to build community and promote the common good within our neighborhoods, cities, and the larger world. A culture of individualism can make us isolated individuals who focus only on our own interests, but we are all social creatures who must love our neighbors and share a vision of how true community can transform the world. How Strong Is Our Neighborhood Community? Sometimes it is possible to live without knowing our neighbors: this is not Christian. Once we bowled in leagues, usually after work－but no longer. This seemingly small phenomenon symbolizes a social change.... Drawing on vast new data that reveal Americans' changing behavior, Putnam shows how we have become increasingly disconnected from one another and how social structures－whether they be the PTA, church, or political parties－have disintegrated. 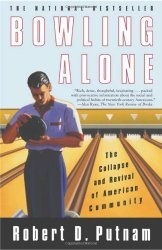 Until the publication of this groundbreaking work, no one had so deftly diagnosed the harm that these broken bonds have wreaked on our physical and civic health, nor had anyone exalted the fundamental power of these bonds in creating society that is happy, well educated, healthy, and safe. No one saves oneself. The community is essential. Over and over again in the Scriptures, we hear that individualism－looking out for our own interests, no matter what－will never ultimately work for us or for our world. We need to overcome our differences and disagreements and gather as the body of Christ, focused on the God who unites us instead of human things that separate us. 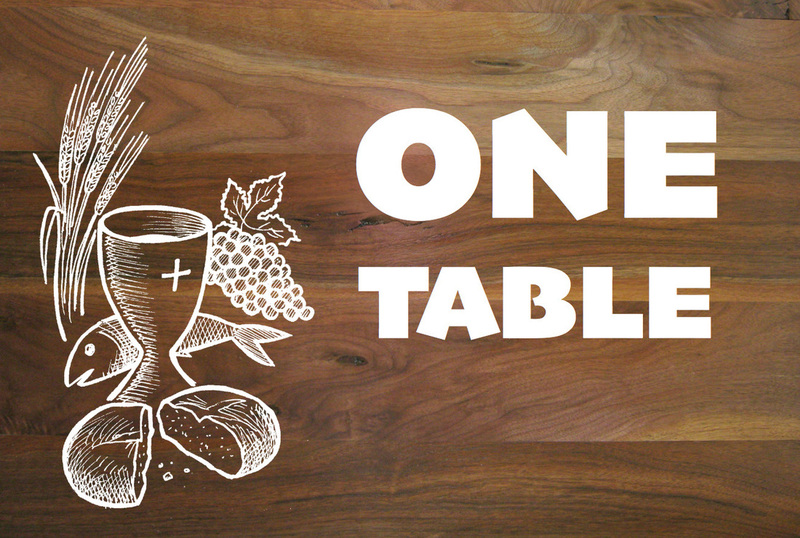 The table fellowship of Christians implies obligation. It is our daily bread that we eat, not my own. We share our bread. Thus we are firmly bound to one another not only in Spirit, but in our whole physical being. The one bread that is given to our fellowship links us together in a firm covenant. Now none dares go hungry as long as another has bread, and anyone who breaks this fellowship of the physical life also breaks the fellowship of the Spirit. In a society which values personal freedom and autonomy, it is easy to lose sight of our dependence on others as well as the responsibilities that we bear towards them. This emphasis on individualism has even affected the Church, giving rise to a form of piety which sometimes emphasizes our private relationship with God at the expense of our calling to be members of a redeemed community. Yet from the beginning, God saw that “it is not good for man to be alone” (Gen 2:18). We were created as social beings who find fulfillment only in love – for God and for our neighbor. If we are truly to gaze upon him who is the source of our joy, we need to do so as members of the people of God (cf. Spe Salvi, 14). If this seems counter-cultural, that is simply further evidence of the urgent need for a renewed evangelization of culture. Text: Members of the Syracuse Cultural Workers Community • Artwork: Karen Kerney. Find posters, postcards, bookmarks, t-shirts, etc., on their site. Pick one... or five... or ten to do this week! Catholic social teaching is often called the Catholic Church's "best kept secret." Living as a disciple means treating our neighbors as ourselves, both in individual interactions, as well as through how our society operates. The Church's social teaching gives us solid principles to live and organize by. Dignity of the Human Person - The core foundation of Catholic social teaching: every human being is created in the image of God and worthy of respect. Human dignity comes from being human, not from what the person does or who the person is. The Common God - We must insist on social conditions that allow people to reach their full human potential and maintain their dignity. These conditions require respect, peace, security, and harmony within societies and across international borders. Solidarity - We are all children of God and members of the same family. Despite all differences and distances, we are called to love our neighbors and fight for what is best for all. Respect for Human Life - Since every human has dignity, human life is seen as sacred and to be protected from conception to natural death. Association - Humans are inherently social. The way we organize society has a direct affect on human dignity and the common good. Family is the most basic form of association and must particularly be promoted and protected. Preferential Protection of the Poor and Vulnerable - The needs of the poor and powerless have to come first. This is necessary to hold society together, promote the common good, and make sure everyone's needs are met. Subsidiarity - Problems and functions should be handled by the lowest-level organization－the one closest to it－that can efficiently and effectively handle it. This is a proper limit to place on governments, and abusive governments often violate this rule. Participation - All people have a right to participate in society, in order to work together for the common good. Democratic participation in decision making respects the dignity of all. I ask everyone with political responsibility to remember two things: human dignity and the common good. We must not be afraid of solidarity; rather let us make all we have and are available to God. Stewardship - We are called to be good caretakers of everything from God's creation to our talents, property, and other resources. We must take care of the planet not only for the planet's sake, but also because neglect of creation has the largest impact on the most vulnerable. Dignity of Work - Work and the economy serve people, not the other way around. Everyone has a right to work, and a right to work with dignity: productive work, decent and fair wages, the organization and joining of unions, private property, and economic initiative. How is the Eucharist calling you to bring people together in your neighborhood and surrounding community? 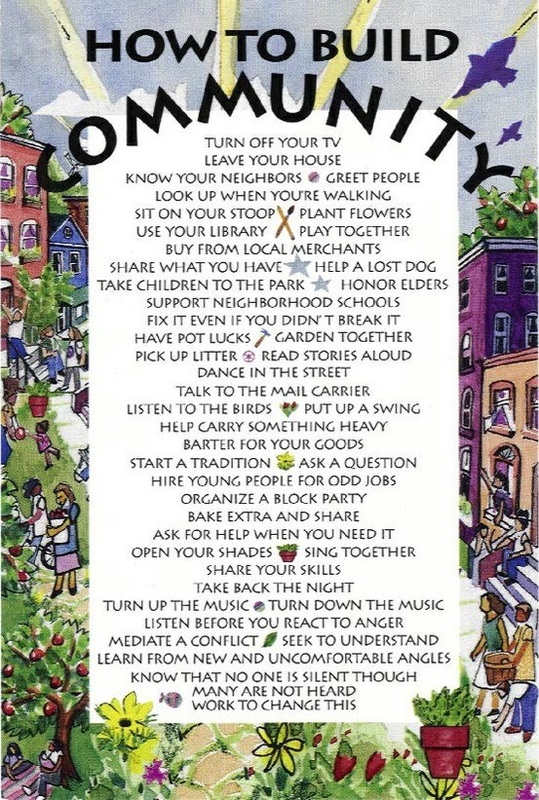 Commit to one or more actions under "How To Build Community" above. Reach out to a neighbor this week and learn his or her name. 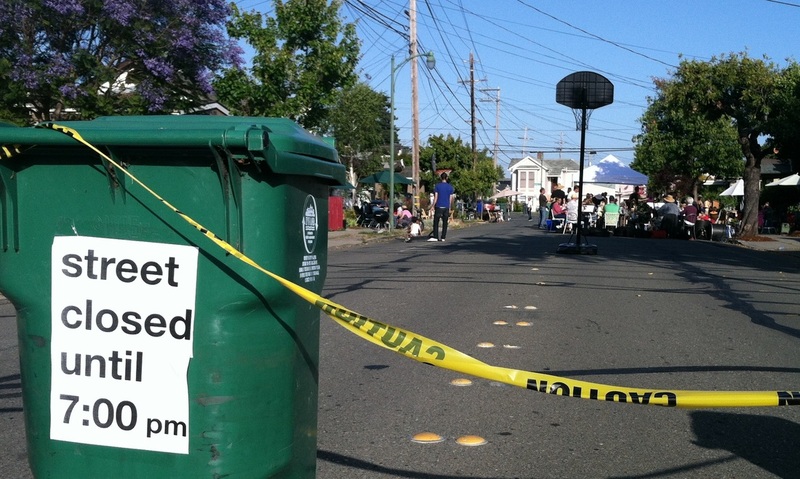 Volunteer or take some action to strengthen your neighborhood community.